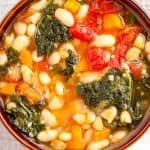 Made from dried great northern beans, this recipe is surprisingly easy to throw together, packed with flavor... and affordable! Using sauté setting... Add oil, onions, carrots, and celery to pot. Cook for about 5 minutes (until onions are translucent and carrots begin to soften). Add vinegar, garlic, thyme, and bay leaf - cook for 2 minutes, until vinegar has evaporated. Add broth, tomatoes, beans, and black pepper to pot. Mix well. Finally, add kale to pot and press down as much as possible, so that most of the kale is submerged. Resist the urge to stir here since it is much more important that the beans are in broth. Lock lid and cook for 15 minutes at high pressure. Once cook time is complete, quick-release pressure and remove lid. Add salt to pot and mix very well. While stirring, remove bay leaf and thyme sprigs. Let soup sit for at least 10 minutes before serving. This will allow the beans to absorb the salt. If you prefer to use canned beans (drained and rinsed), cook the soup for 4 minutes at high pressure. Then quick-release the pressure.